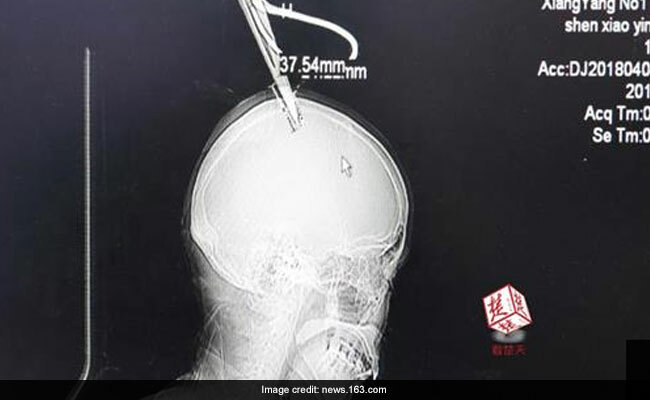 A woman in China is miraculously alive even after a pair of scissors pierced through her skull. Shockingly, after the accident, she took a bus all to the hospital by herself to get treatment, local media said. The woman, identified only with her last name Shen, was working on her farm harvesting mahogany leaves when the incident happened. Unable to reach the tree, she attached the scissors to a bamboo pole which unfortunately snapped and pierced through her scalp, Daily Mail reports. Despite the terrifying mishap, the 57-year-old managed to stay calm and opted to take a public bus on her own from her village in Hubei province to a hospital in Xiangyang city in the same province, Shanghaiist quotes local media. The woman said she didn't feel any pain, only slight numbness in her head, the report said. The journey from her home to the hospital reportedly took an hour. Images from the hospital show the woman, with her head shaved, being operated upon by doctors. Photos and x-ray show the blade of the scissors stuck in the woman's head. Doctors at the hospital performed two minimal invasive surgeries on the woman and safely removed the scissors from her skull. She continues to remain under observation. According to local media, the scissors were barely 2-3 millimetres from her brain and embedded at an angle. Doctors believe if the scissors had pierced through vertically, the woman could have been left paralysed.